Seoul’s southern district, Gangnam, holds one of the cities greatest park and recreation areas – Yangjae Stream. Here’s a photo of a summer evening (tonight). There’s a public pool, jogging path, roller blading arena, land bicycle path. Many summer events are held alongside the stream such as music performances and outdoor movies. 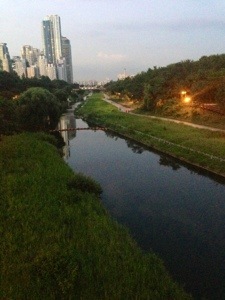 This entry was posted in About Korea and tagged Gangnam, Seoul, Yangjae Stream by easykorean. Bookmark the permalink.